You’re invited to participate in the 9th annual “Motorcycle Ride for Dad” on June 18 in Calgary. The ride raises funds to fight prostate cancer through research and education. The organization has donated more than $15,000,000.00 to the cause. Prostate cancer testing for over 1,500 men has also been sponsored at various events in our city. All of the money that the riders raise stays here in Calgary. This year many men will also have the opportunity to have free prostate cancer testing. The Calgary Chapter will sponsor 10 Man Van™ events throughout the city, raising awareness and bringing the PSA testing out to where the men are. Operated by the Prostate Cancer Centre since 2009, the van offers free Prostate-Specific Antigen (PSA) blood tests to men over 40 years old. PSA is a protein produced by prostate cells and can assist in the diagnosis of the cancer. This year’s ride will be approximately 2.5 – 3 Hours. It will begin with a parade of motorcycles escorted by the Calgary Police Service through the city, followed by a scenic country poker tour. Afterward, riders can enjoy a live & silent auction, door prizes, awards and a BBQ at the Springbank Park For All Seasons Community Centre 32224A Springbank Rd. In 2014 over 600 riders participated in the 8th “Motorcycle Ride for Dad.” Last year 430 riders attended and raised $55,275 for the Prostate Cancer Institute in Calgary. You can make this year’s event another success by participating in the ride or by helping to raise funds. Corporate sponsorships, donations in kind, auction items or prizes are all appreciated. 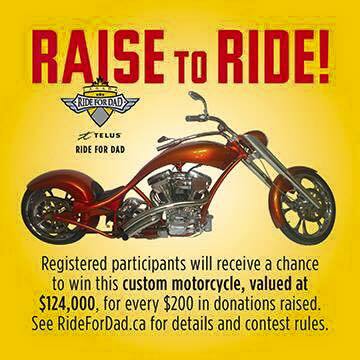 You can register online at www.ridefordad.ca. Alternatively, you can register on site Friday June 17th from 5:30 pm or register before the race on Saturday, June 18th starting at 8:30 am. The cost for riders is $30 which includes your BBQ ticket. You can also create your own team and register online to raise funds for the ride. Registered participants will receive a chance to win a custom motorcycle, valued at $124,000, for every $200 in donations raised! The ride will be departing from the First Alliance Church parking lot at 10:30 am Saturday, June 18th. Photo Contest Closes May 20 – Enter Soon! Enter our Fish Creek Photo Contest by Friday, May 20 for a chance to win one of several great prizes. Simply submit a photo you’ve taken in Fish Creek Provincial Park along with a title, description, the location (“Fish Creek Provincial Park” or a specific area in the park), your name, and your email address. The Grand Prize for the Judges Category is a $500 gift certificate to The Camera Store! 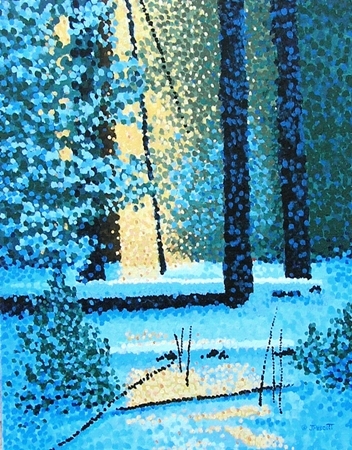 The Judges Category Second Place Prize will be announced. If your photo gets the most votes from our readers, then it will win the Voting Category Prize. 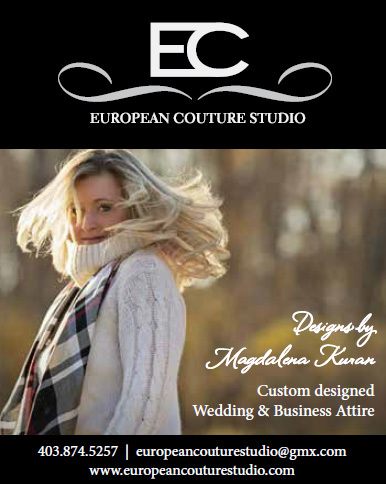 The wining photographer will receive a Stoney Nakoda Resort & Casino and Rockies Heli Canada getaway! Make sure to vote for your favourite photo if you haven’t already done so. We look forward to seeing your photos of Fish Creek Provincial Park! The Friends of Fish Creek are planning a FREE evening to remember! Bring the whole family along to Fish Creek Provincial Park for this special night under the stars. During the Fish Creek Star Night, you can view the night sky through telescopes with members of The Royal Astronomical Society of Canada. You’ll also be able to take guided night walks through the park and learn about local night creatures. Warm up and continue the fun with indoor activities and displays. Cover your flashlights with red to prevent night vision loss (thin fabric or tissue paper work well). Even if the weather is cloudy, this event will still run. No registration is required. 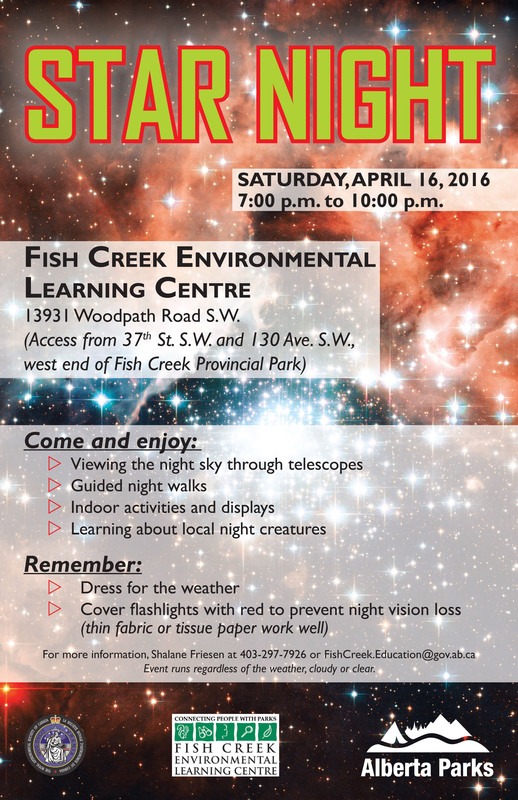 Event is from 7:00 p.m. to 10:00 p.m. Saturday, April 16 at Fish Creek Environmental Learning Centre. Get fit and support a good cause at the same time! You can run or walk for Fish Creek Provincial Park as part of the Scotiabank Charity Challenge marathon on Sunday, May 29. The Friends of Fish Creek are trying to raise $10,000 to support conservation and community outreach activities in Fish Creek Provincial Park, and this is a fantastic way to help. The park is utilized by many in our community. It has over 50 km of pathways and trails of varying difficulty, and its diverse natural landscapes makes it a perfect escape from city life. Even if you don’t consider yourself athletic, you can join the cause. 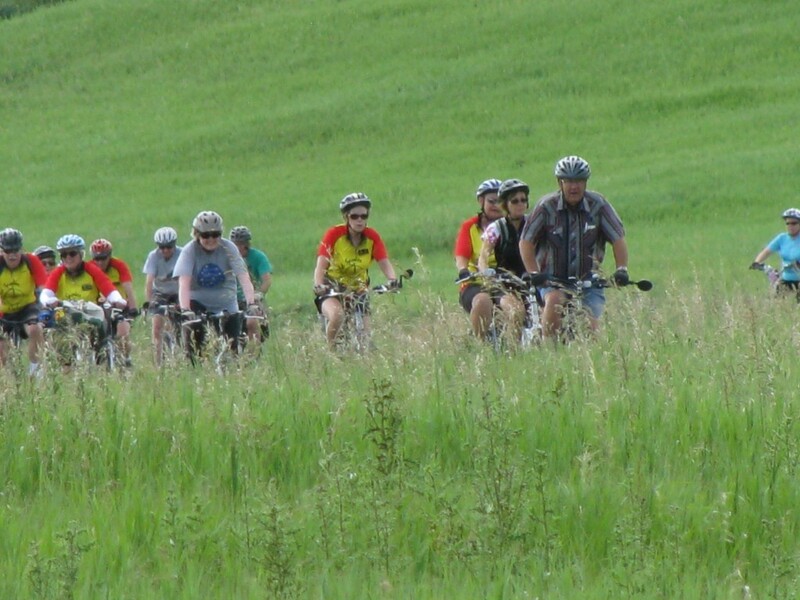 No matter what your ability, you’ll be part of a team that supports the sustainability of Fish Creek Provincial Park. Plus, participants can take advantage of training seminars. There’s also no need to worry that you lack fundraising skills. Participants will receive fundraising tools, ideas, and tips. 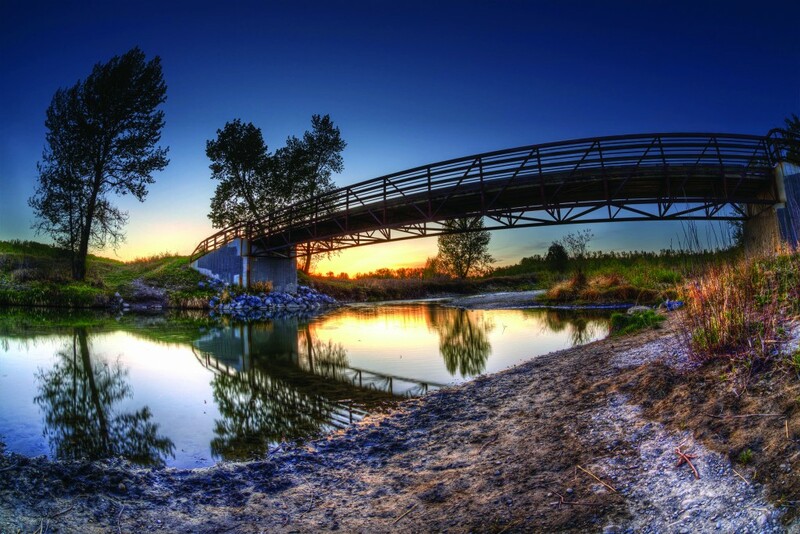 The Friends of Fish Creek want to equip you to make every part of this venture a success! Finally, you’ll also get a discounted registration fee if you run (or walk) for Fish Creek Provincial Park. Click here to get your promo code for the discount on the registration fee! You’ll also find a link to registration. There’s no need to worry about the Park’s landscape being permanently disturbed. The work area will be restored to its original condition later this year. The restoration is scheduled to take place in summer of 2016, and the work will also include a new paved pathway connecting the Park to 146 Ave. along Bow Bottom Trail. Our observations during the summer of 2015 was the visitation to the Mountain National Parks in Western Canada was up sharply in 2015 over visitation in 2014. Since the summer, as we have spoken with our clients within the parks, along the Cowboy Trail and in and around Kananaskis Country, most have confirmed that their 2015 sales were up between 6% and 30% over 2014. “Though the final numbers for 2015 visitation will not be complete until February, as of October 2015, Statistics Canada reports that Canada has experienced an overall increase in international visitors of 7.3%. This includes significant growth from the United States, and continued growth in China – two of our most important markets. We would agree with Statistics Canada. Given the great value of the safe Canadian experience, the number of international tourists within Western Canada during 2016 will continue to grow. That, combined with the growing Canadian trend of the Staycation, should cause the tourism industry to be a bright spot within the Canadian economy, and especially here in Alberta! There is plenty to do in Alberta this week! First of all, the Friends of Fish Creek Annual General Meeting begins tomorrow at 7:00. (Registration starts at 6:30). If you attend, you’ll be able to hear the board’s plans for 2016 and provide your input. If you are a Member and have paid your 2015-2016 membership dues, then you’ll also be eligible to vote. Join in giving back to your community and helping Fish Creek Provincial Park to thrive in the upcoming year. Refreshments will be served. Please register if you plan to attend. On Friday (January 29), you can the 1st Annual Kick Off to Québec Carnival Fête at the Bow Valley Ranche Restaurant, organized by The Historic Bow Valley Ranche. This event is a tribute to the 60th Anniversary of the twinning of Calgary and Québec City as sister cities. If you attend, you’ll get to see the “twin” of Bonhomme (the snowman mascot of the world’s largest winter carnival – Québec City’s winter carnival), watch the Le Chateau Fashion Show, eat a fantastic meal of French Canadian cuisine, and enjoy live entertainment from some of Québec and Calgary’s musical artists. The tickets for the Annual Kick Off to Québec Carnival Fête are currently half off. Don’t delay in purchasing them! Click here to purchase tickets and learn more about this memorable evening. Want to make a difference in the community? Then plan to attend the Friends of Fish Creek‘s Annual General Meeting on Thursday, January 28, 2016. Registration is at 6:30 pm, and the meeting starts at 7:00 pm. The meeting location is Fish Creek Environmental Learning Centre, Shannon Terrace, Fish Creek Provincial Park (13931 Woodpath Rd. SW – Access via 130 Ave. SW and 37 St. SW). The Friends of Fish Creek work to engage the community through education and awareness to conserve Fish Creek Provincial Park. FOFC members, volunteers, and donors have enabled the park to continue to thrive as an urban getaway, a natural habitat and a recreation center. At the Annual General Meeting you’ll be able to have your voice heard and meet the FOFC board. You’ll have the opportunity to hear first-hand about plans for the upcoming year and to provide your thoughts. Members who have paid their 2015—2016 Membership dues are eligible to vote. Please be sure to register if you plan to attend. You can contact Friends of Fish Creek Provincial Park Society at (403) 238 – 3841 if you have any questions. Refreshments will be served at the meeting. The holidays are over, but you can still look forward to a special winter celebration at the Bow Valley Ranche Restaurant on January 29, 2016. 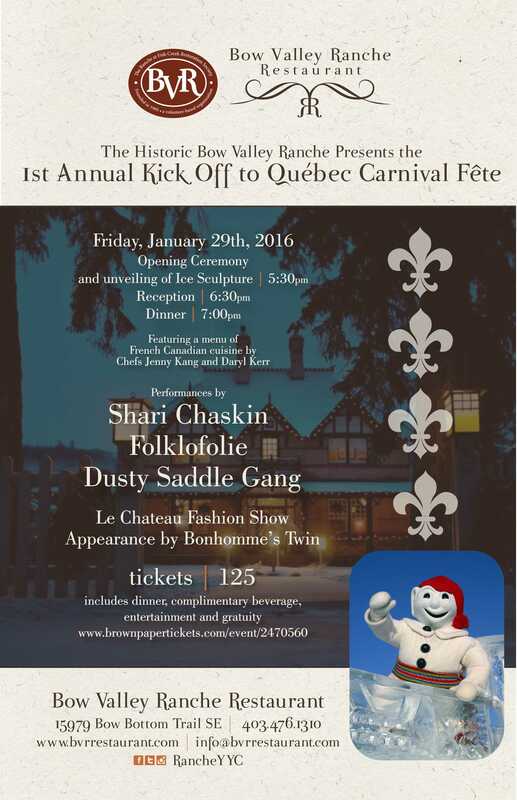 The Historic Bow Valley Ranche will be presenting the 1st Annual Kick Off to Québec Carnival Fête. This event is a tribute to the 60th Anniversary of the twinning of Calgary and Québec City as sister cities. At 6:30, warm up indoors while enjoying entertainment provided by Québec fan favourite Shari Chaskin, Québec-based duo FOLKLOFOLIE and Calgary’s own DUSTY SADDLES. You’ll also get to view the Le Chateau Fashion Show. A delectable meal follows at 7:00 featuring a menu of French Canadian cuisine by Jenny Kang and Daryl Kerr. Strawberry Banana Flambé, Duck Rillette with cranberry mustard, Pear and Bleu Cheese Mini Tart and Opéra Cake are just a few items on the menu. The dinner menu is a tribute to Québec’s culinary heritage. Tickets include dinner, complimentary beverage, entertainment and gratuity. Each ticket is $125. Don’t delay in ordering – there are only 200 tickets available for this special event. Click here to purchase tickets. This time of year, friends are planning festive holiday gatherings, and the Friends of Fish Creek are no exception. Join the nonprofit organization on December 16 from 1-4 pm for a Winter Open House. 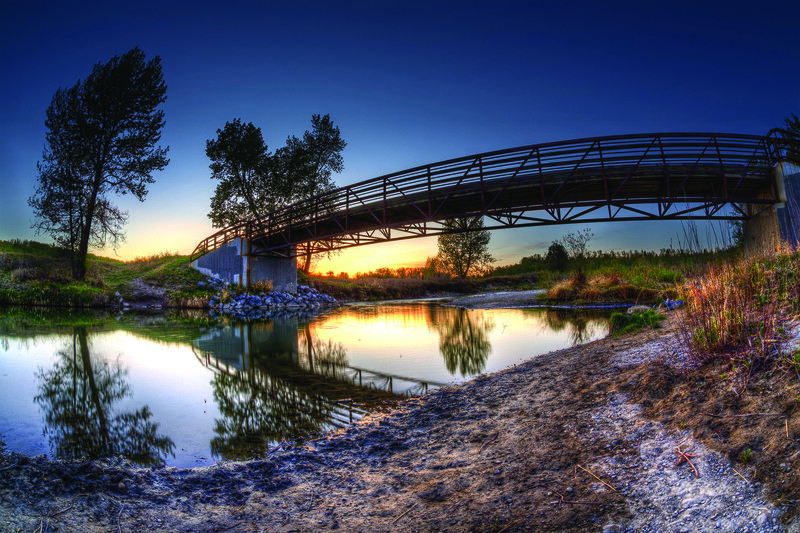 The Friends work hard throughout the year to preserve Fish Creek – a naturalized urban park – by engaging the community through education and awareness. While you’re at the open house, you can relish the joy of the season, share your favorite experiences in Fish Creek, and learn more about upcoming activities and programs that the Friends of Fish Creek have planned. 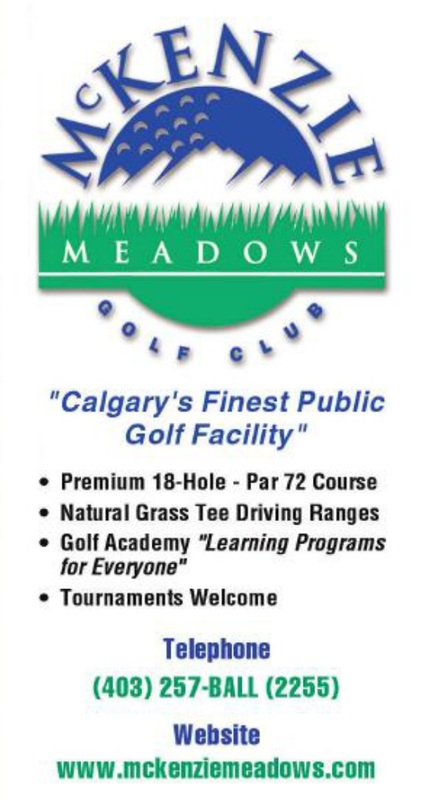 You can also renew your membership, pick up a new Friends of Fish Creek t-shirt, and enjoy warm drinks and yummy treats. If you’re planning to come to the 2nd annual Friends of Fish Creek Winter Open House, then RSVP at info@friendsoffishcreek.org. Click here to learn more about Friends of Fish Creek.